As with any fashion week, the grand finale on day 5 of WIFW Autumn/Winter 2013 was possibly the most anticipated. Manish Arora made it worth the wait. 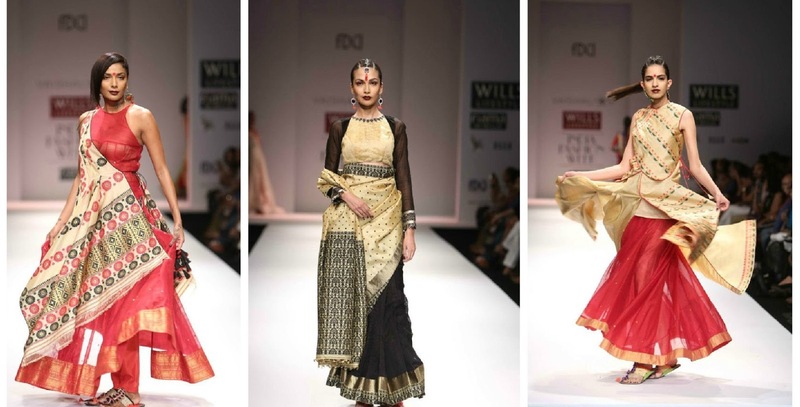 Vaishali S brought to light the culture of Assam with her collection, with a palette of mainly earthy colours. To go with her inspiration were absolutely fabulous hairstyles, all of them slightly ethnic with a twist. The sleek ponytail got a tight braid running through the centre of it (a look we can happily recreate for the summer), with some models sporting delicate maang tikkas. Also seen was a deep side partition, with poker straight hair pulled over on to the other side - a modern twist to the traditional ensemble. Manish Arora gave us innovation and avant-garde design not only with his clothes but also with hair. While the sleek ponytails and a half-up-half-down look (something else we can try for this summer!) were nothing we haven’t seen before, out walked some models with candyfloss hair, wrapped in bandanas. An edgy look that we wouldn’t dream of pulling off the runway – unless you think you have the chutzpah to try it! So what do we take away from the Wills Lifestyle India Fashion Week A/W 2013? Sleek, tied back hairstyles go a long way for almost all outfits, for starters. But we also found that combining two hairstyles can often lead to some pretty funky stuff. This summer, aim for the bouffant + braid style that we saw at Sanchita. For those of you who are more daring, the braids + updo look that we saw at Anaikka by Kanika Saluja is a great way to beat the heat. In the meantime, there’s another fashion week to look forward to! That means a whole new collection of hairstyles for you ladies to try out at home. Looks like this Autumn/Winter fashion week is going to make it a very stylish summer for us!